Sister Grace entered Religious Life in 1927 when she was 15 years old after having the Sisters of St. Dominic as teachers in Brooklyn. Her life has been a long journey, but the common thread has been teaching – whether it was teaching math, psychology or English as a second language. 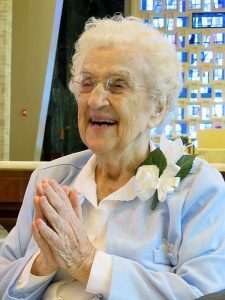 Later in life, she taught spiritual life seminars and offered workshops. Even after she retired, she led weekly Scripture classes at Dominican Village, a nearby nursing home. The theme for her life became, “Teach wherever you can,” she has said, noting that she is part of the Order of Preachers. S. Grace also earned a bachelor’s degree in education and a master’s in mathematics from St. John’s University, as well as a doctorate in counseling and guidance from Fordham University. 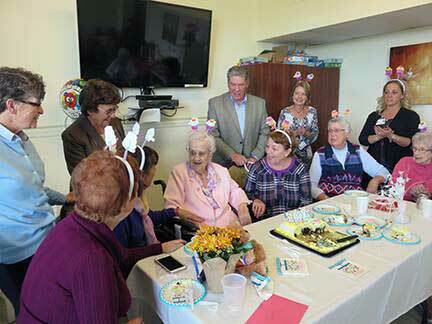 There are two other Dominican Sisters of Amityville who are 100 years or more including Annette Marie Sledzaus and Francis Dominici Piscatella.